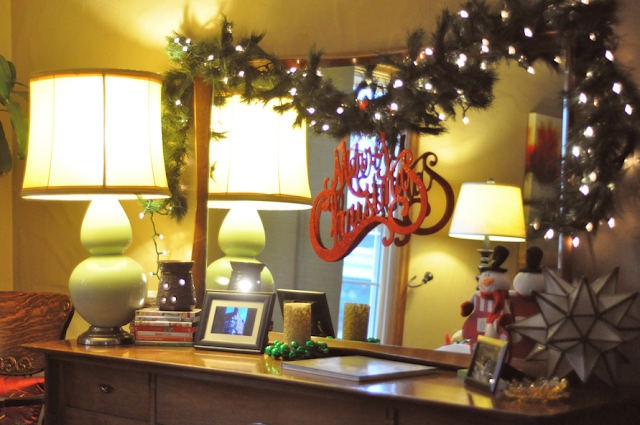 'Tis the season for parties and loads of eating. 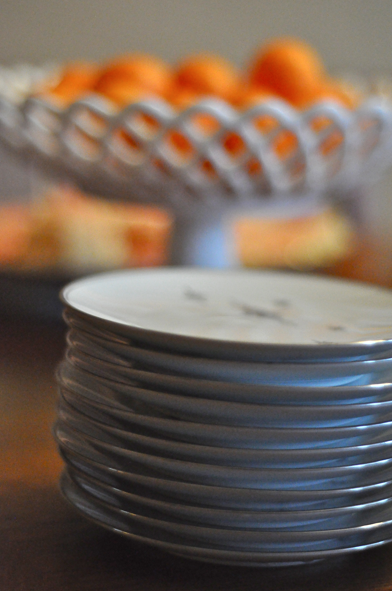 This weekend I hosted a White Elephant party with my friend Stephanie (who blogs here). We had the party at her house, so she took care of the decor while I did the food. My main goal when hosting a holiday party is to make foods that are easy to prepare and allow me to socialize with guests instead of sit in the kitchen. I am a big fan of fancy hors d'oeuvres, but sometimes simple and traditional party foods can be more fun and hassle free than anything else. Dessert wise I think keeping things easy to hold or grab/eat without falling appart is important. I choose cupcakes over cake because they don't need to be cut (avoiding an unnecessary mess) and are a good portion size. On the other hand, if you are prepping for a birthday party, a cake is a must. 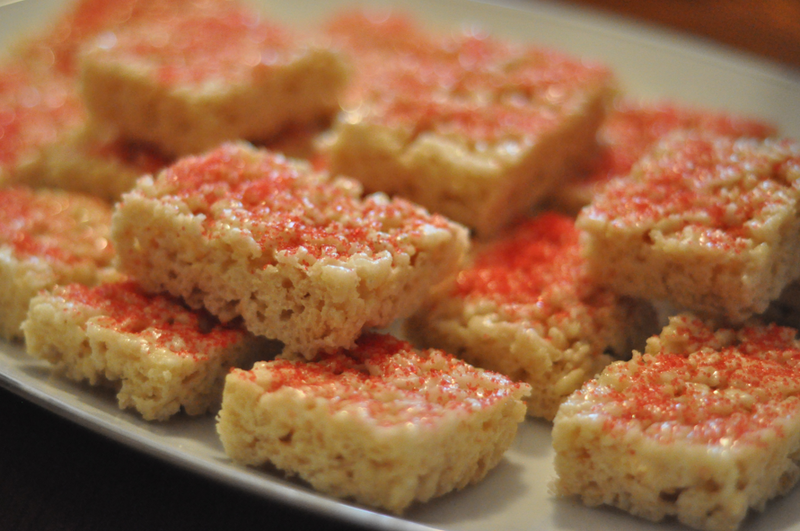 Rice crispy treats are also one of those desserts I tend to make on one day of the year, around Christmas time. I've seen them done in various ways, last year I cut them out into little Christmas cookie shapes. I find them fun, delicious (in that, weird, not sure why I am eating this, kind of way), and traditional. 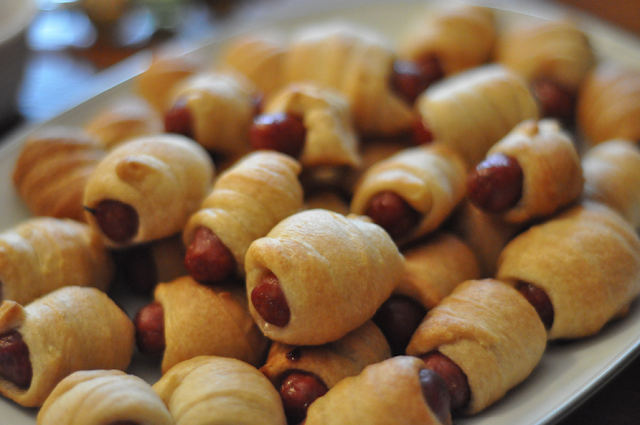 On the savory side, I happen to be fascinated with pigs in a blanket (I make them with kosher beef though). I suppose the biggest reason they fascinate me, is because I never had them growing up. My mother was not a pigs in a blanket kind of woman I guess. To me they are cute, and fun to eat and taste kind of amazing. And the fact that they are so cliche makes me love them even more, with a side of ketchup! 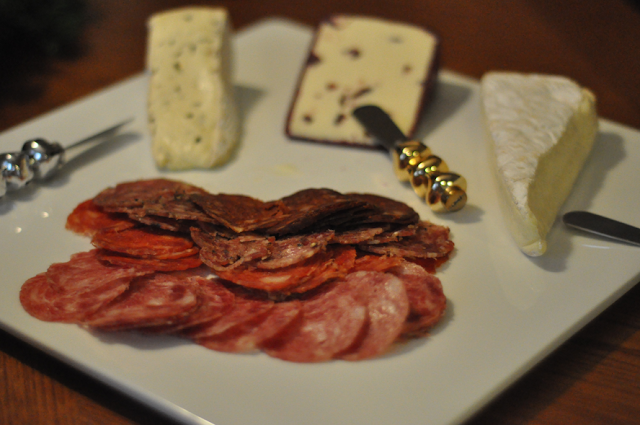 A cheese and meat plate with tasty crackers and some condiments is always a safe bet as well. I tend to select cheeses that are easily spread (this year I picked two bries, a mushroom brie and a plain) and maybe something more seasonal (I did a cranberry cheese). 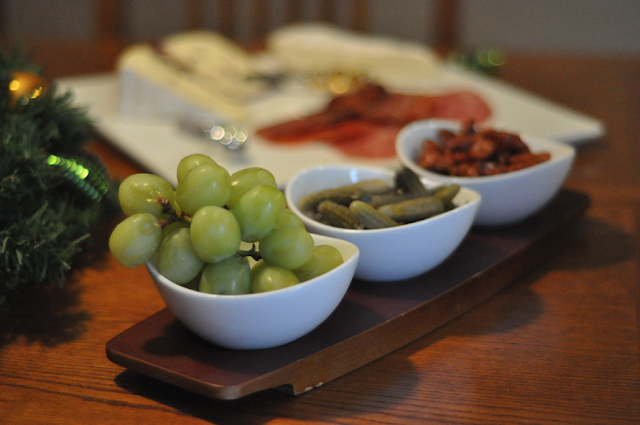 Condiment wise, grapes, Spanish candied Valencia almonds, cornichons. 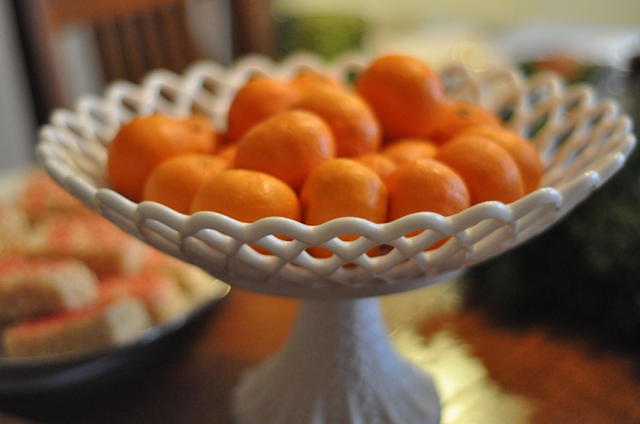 Little Satsuma oranges are fun for the holidays and look great in a raised bowl. If you feel like you need one extra dish to fill people's bellies, I like to make a cream cheese and pesto dip (I got the recipe from a friend and have made it for most of my parties since). It's always a hit, is absolutely the easiest thing to make and fills everyone up. Champagne with frozen cranberries tossed is very festive. 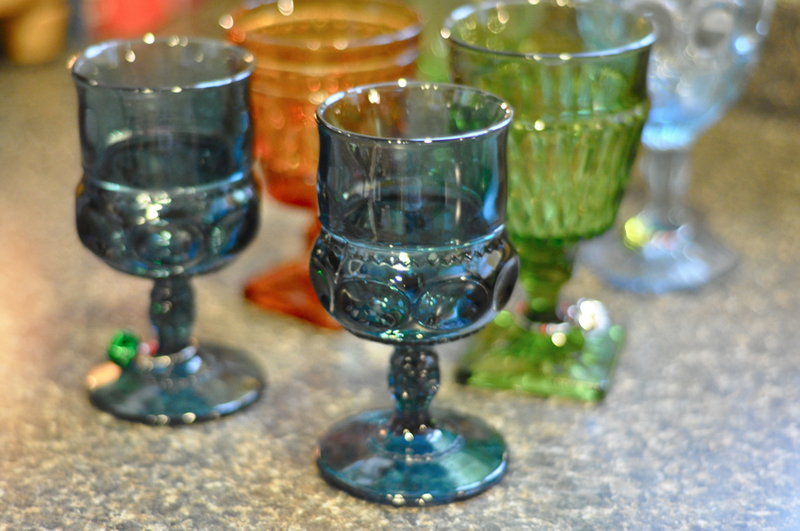 Use mismatched or vintage stemware to add more character. So there you go, easy to prepare party nibbles that are always tasty. If you have a spare moment maybe pop by my blog and say hi? awesome! I will have to check out your blog. Thanks! 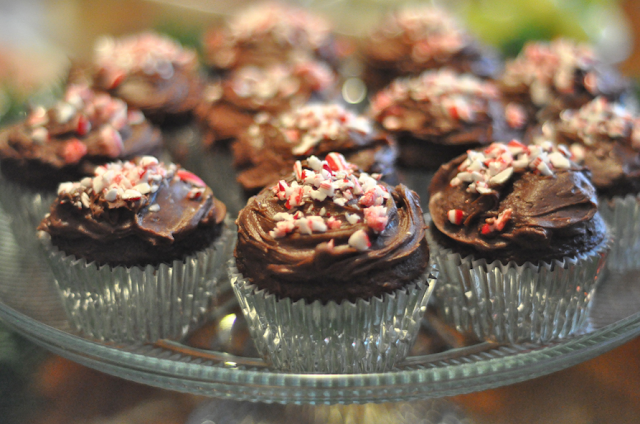 Did you sprinkle broken candy canes on the cupcakes? Genius! Yes I did! I used the small candy canes and crushed them in a zip lock bag, using a rolling pin. I will be posting the cupcake recipe very soon. It is one of the tastiest, so keep checking in! Thanks! It worked out well. omg at those rice crispy treats! mouth watering!